Let me honest for just a moment. 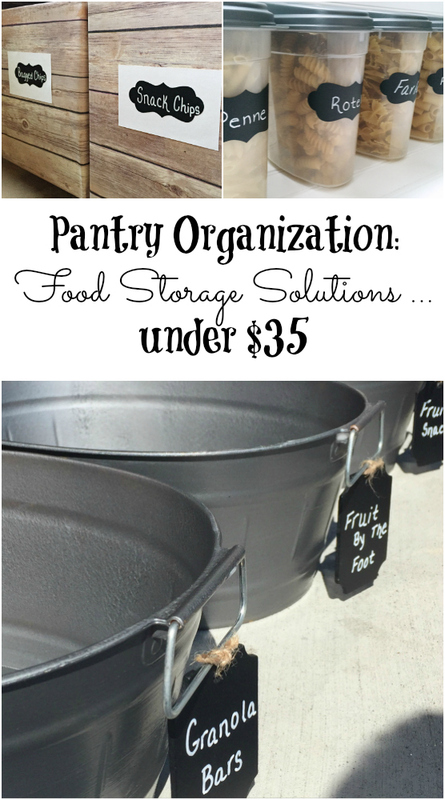 I drool over the pantry makeovers I see on Pinterest. I even have a board dedicated to Mudroom and Pantry Inspiration. For the record, my mudroom/pantry will look nothing like those beautiful photos. The $100 limit is pretty much putting a damper on that. 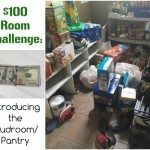 As I was looking around for food containers, I found that most cost between $10-20 EACH! BUT… don’t fret, I found some ways to create food storage containers that cost a whole lot less… I just had to think outside the box… or use the box. If you follow me on Instagram, you’ve already gotten a few sneak peeks. I did notice a little spray paint chipping off the bottom, so I went over the bins with some Mod Podge to help seal the paint. I cannot take credit for this brilliant idea. I first saw it done by Lauren over at Bless’er House. While Lauren used diaper boxes for this project, I used some leftover Costco boxes and boxes that used to hold reams of paper. I found some wood-looking paper on Amazon, and used it to wrap the boxes. (This is actually paper for a photo backdrop, so it’s huge: 12 ft. x 4 ft.). I started by adhering the paper with Mod Podge, but it got a little bubbly, so after the first sheet, I used an adhesive spray, and that worked a whole lot better. 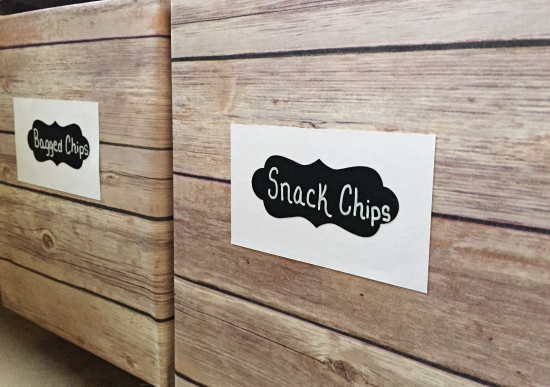 Add a chalkboard label on a notecard, and these boxes-turned-crates are used to store bags of chips and pretzels. I buy a lot of pasta. 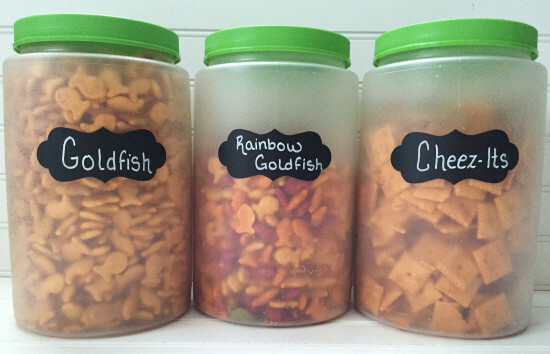 My kids love it, and so do I. I buy all the different shapes, so I went ahead and bought a few containers (at the dollar store) and added some adhesive chalkboard labels. The containers held exactly one box of pasta, so it was perfect. For the rice, I used some canisters I already had on hand. Since I’m repurposing boxes and plastic tubs already, I thought, why not add some old soda boxes to the mix. 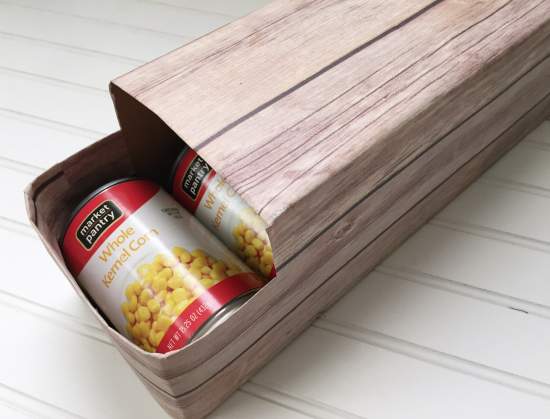 I needed something to hold my canned goods, and as I was about to recycle an old soda box, I realized it would be perfect. 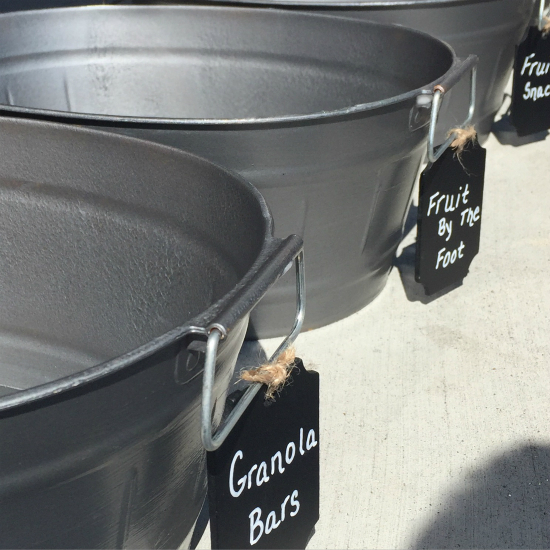 I once again went with the wood paper and I’ll be adding chalkboard labels (ran out…oops). What I love about chalkboard labels, and the reason I used them on everything, is because I can change the label whenever the contents of the container change. They really look great. Does the paint peel off? These bins have just now started to peel a little bit (2 years later), however, I have learned a few things since making these that I share in this post: https://www.lemonslavenderandlaundry.com/spray-painting-plastic/ Mainly, if using glossy bins, sand them before spraying (which I didn’t do here). Second, find a spray paint that says it works on plastic (also not something I did). I made similar bins in my coat closet that used the tips from the above post, and they haven’t chipped at all (19 months later). OMG! 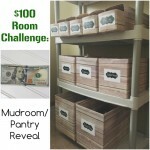 I love your idea for the pantry! At my age late in life I’m seeing all kinds of ideas and crafts! I love it! I always think to myself, “Why didn’t I think of that? !” Lol! I, too, found you from Hometalk, a little late, Jan. “2017” but hey, you’re never too late or old to learn new things! Love it Erin! Thanks and I can’t wait for my emails from you to see more since I’m not talented enough to visualize things myself, lol! P.S. I will have to cut out the directions from some of them & keep them with them as far as how long to cook them etc, since my memory isn’t what it used to be, lol! Your comment brightened my day 🙂 You are so right, never to late to learn and try new things. So happy to hear that you’ll be following along with the blog through email. 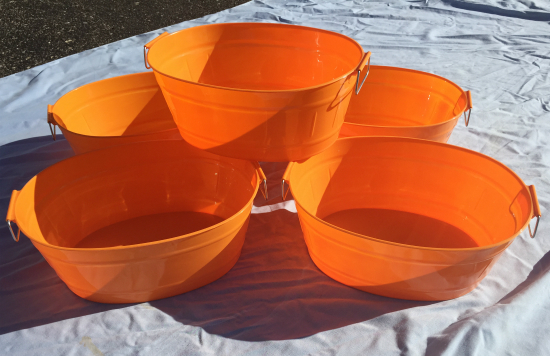 I just saw the re-post of this from My Repurposed Life and got sooooooo excited that there were large orange bins out there to be had!!! It’s my favorite color and I love orange baskets of any kind. Then I realized this post is from a year ago. Whomp whomp. The upside is — my last name is actually Wood so I will be getting those big sheets of wood paper and using them for something crafty! I would really like to see photos of your own storage closet. You seem to be so organized with everything in your home. 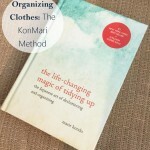 Are all your closets neatly done like bathroom, kitchen, closets, etc.? They tell me I’m OCD about cleaning and germs. I’m constantly cleaning. So can you post your pantry, etc.? I love all your ideas and your such an inspiration to me!! Look forward for you emails!! Hi I was wondering where you got the chalk lables, I love them! I found them at Michael’s. They also have them at the Dollar Tree. Loving your work and your ideas! I have one question though, does the paint chip off from plastic? I wanted to try and do this to house my onions, garlic, and fruits; I am just worried that it might contaminate the food. When I just spray painted the bins, I did notice some of the spray paint chipping off, so I sealed it with Mod Podge. It’s been 5 months and I have not noticed any further chipping of the paint. I have only put items that are wrapped (granola bars, etc.) 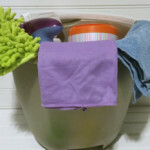 into the bins, but if you want to add fresh vegetables (like the onions and garlic) you could add a fun towel to the inside just to ease any concerns about spray paint chips getting on the food. Great question Joey! 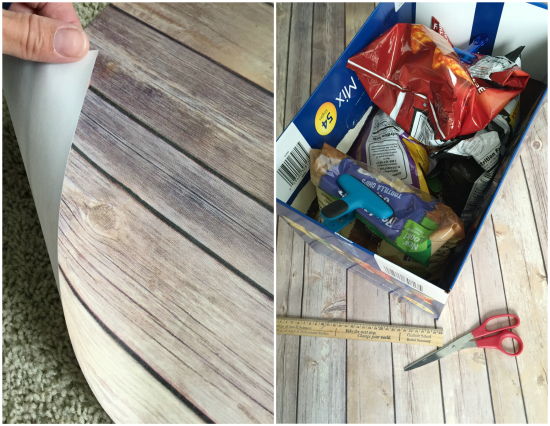 I never thought of modge podge to seal! I see lots of the things at the $Tree (we are on a first name basis) in fact I have the same round canisters you have. 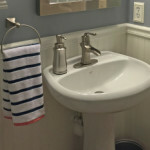 Love your post, I really would like some coordinated pretty in my cabinets. My only concern with all of this which looks great is that I would include a sticky or the expiration date from the packages in the containers or taped to the back. I have to see expiration dates as I live alone and it takes a while for me to finish a product. I had bought one of those containers that you used for the pasta BEFORE I saw this post. I was inspired to reorganize my baking stuff. I went and bought 11 more and I’m using them to hold chocolate chips, nuts, baking mix, dried cranberries, powdered sugar, etc. I put them on a tall narrow shelf that I already had that fits perfectly in my small kitchen. I am also doing the spray painted baskets for kids snacks. 🙂 Thank you for the article and inspiration!! That sounds awesome! I love the idea of using the containers for baking goods. Glad you found some inspiration. Enjoy your weekend Lauren! If it wasn’t for you, I wouldn’t know “wood looking” wrapping paper existed. I always try to give credit where credit is due. Thanks for the inspiration! Enjoy your weekend Lauren! I love the wood paper! Such a great idea – thanks. Isn’t that wood paper so fun?! Thanks for stopping over Lisa! Have a great day! I also spray painted the same dollar tubs and named each container for hair/skin care products in linen closet. Love that idea Carolyn! Thanks for sharing! Enjoy this first day of fall! Absolutely. It is Rust-Oleum Hammered in gray. Thanks for you question! Have a wonderful Monday! Diane- I am interested in this. The soda boxes are a little flimsy, I was thinking of reinforcing them somehow. 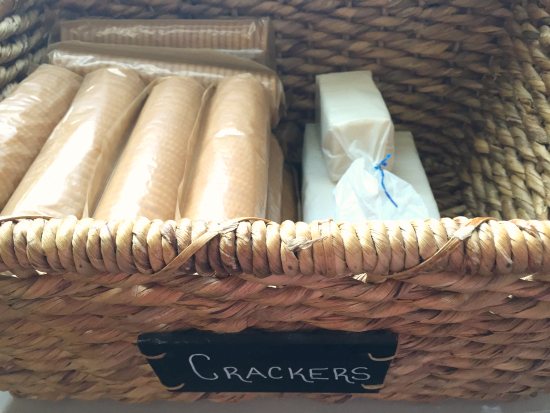 I haven’t heard of Austin crackers before. Where would I find them? Thanks for sharing your idea. I will definitely look into it! You can buy the Austin Crackers at Walmart.